Welcome to the longest business lounge foodline worldwide! Sheremetyevo became the first Russian airport set a world record and get featured in the GUINNESS WORLD RECORDS history books. 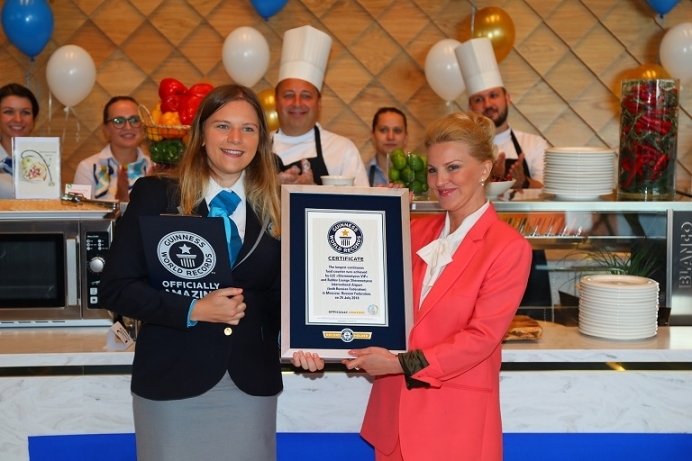 The continuous foodline in Rublev business lounge recognized by Guinness World Records as the longest continuous food counter. MOSCOW, Russia, 2018-Aug-01 — /Travel PR News/ — The independent surveyor in the presence of an official GUINNESS WORLD RECORDS adjudicator measured the counter in Rublev business lounge — its length is 34m. After the record was confirmed, the adjudicator presented Ms. Tatyana Kuznetsova the CEO of LLC Sheremetyevo VIP with the GUINNESS WORLD RECORDS certificate. “It is a special honor for Sheremetyevo International Airport to achieve this GUINNESS WORLD RECORDS title. Our team aims to provide the highest level of business services setting customer satisfaction as our top priority. Exclusive interiors of our VIP and business lounges are based on cutting-edge technical and design solutions. It is noteworthy that longest continuous food counter is in the Rublev business lounge, whose design was recognized as Europe’s best by the independent evaluations,” emphasized Tatyana Kuznetsova. During the later part of the ceremony the GUINNESS WORLD RECORDS adjudicator, together with the CEO of LLC Sheremetyevo VIP, unveiled the commemorative plaque “Welcome to the longest business lounge foodline worldwide!” in gold written on the front side of the food counter. Rublev business lounge is located in Terminal B and is recognized by architects as one of the best in Europe. Its design incorporates various elements of Russian architectural aesthetics. In particular, the pavilions, which divide the lounge into several areas, are designed in the form of braided onion-shaped domes. Interiors are created by the world famous design bureau M + R interior architecture. Rublev’s area is 2608 sq. m, it can accommodate up to 456 guests and has a dressing room, a comfortable lounge zone, a work area and a separate room for children as well as spacious sleepboxes. Sheremetyevo pays special attention to the improvement of business services. The airport offers passengers 5 VIP and 13 business lounges. More than 2.3 million guests used business lounges in 2017. It is 20% more than in 2016. Sheremetyevo International Airport is the largest Russian airport in terms of passenger and freight traffic, takeoff and landing operations, the area of the airport facilities and the capacity of the cargo facilities. LLC Sheremetyevo VIP is the exclusive operator of VIP and business lounges at Sheremetyevo International Airport. This entry was posted in Airports, Food & Drinks, Travel, Travel Awards, Travelers and tagged atyana Kuznetsova, GUINNESS WORLD RECORDS, ood counter, Sheremetyevo International Airport. Bookmark the permalink.